The best way to prevent getting infected is by protecting yourself from tick and insect bites. Avoid coming in contact with ticks when you are outdoors, as they can attach as you brush past grass and plants, especially in wooded and bushy areas. Apply insect repellents, according to label instructions, and wear protective clothing, when outdoors. In addition, let the Tuff Lawn experts provide an additional layer of protection to your property. Our DEP-licensed technicians will apply a tick control application at regularly-timed intervals during the season from spring through the fall. Our applications are applied to all lawn and landscape and up to 30 feet into wooded perimeters, as well as brush and wood piles, groundcover, shrubs and landscape beds, stonewall areas and fence lines. We make sure to leave no place for these blood-thirsty critters to escape. FACT:	Nearly 90% of all Lyme Disease cases have been reported in the northeastern part of the United States. Roughly 70% of people who develop Lyme Disease in North America catch it from ticks in their own yard. FACT: Powassan disease is on the rise in our area. You may have heard all the news reports about the “new” tick disease, Powassan. This was actually discovered over 50 years ago. While still rare, there has been an increase in the number of ticks found to carry the virus, as well as an increase in reported cases, in our area. Powassan is spread by the same deer tick that transmits Lyme Disease. While comparisons are often drawn between Powassan and Lyme, the two conditions are not the same. Lyme is a bacterial illness, often treated with antibiotics, while Powassan is a flavivirus, with no current cure. The best way to prevent getting infected is by protecting yourself from tick bites. Ticks are often found on low bushes, tips of grass, leaf litter and ornamental ground cover in shaded areas and in the woods. Ticks do not jump, fly, or drop from trees. On lawns, most ticks are found within nine feet of the edge of the woods. If you find a tick on your skin, remove it immediately before it has a change to bite and attach. Conduct full-body checks on yourself and your family, especial in the hair. Don’t forget your pets. Let the experts at Tuff Lawn provide a program to better help protect you, your family and pets from ticks and the diseases that they carry. 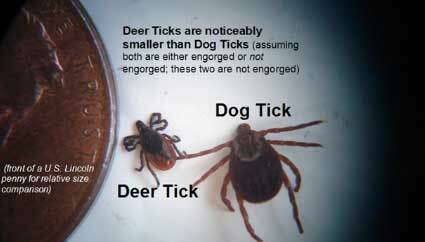 The deer tick, about the size of a sesame seed, is responsible for the spread of Lyme and other diseases among humans. They mainly feed on deer, although they can also be found on mice, dogs, cats, raccoons and squirrels. American dog ticks feed on warm-blooded animals, including dogs and humans. They have been known to transmit Rocky Mountain spotted fever, as well as other diseases. In the 1990’s Lyme disease became a major concern for all who lived in Connecticut. An explosion of Lyme disease in our area in the mid-1990’s increased the demand for tick control services. The result was the creation of the newly formed Fairfield County Tick Control, a division of Tuff Lawn. Let the experts at Tuff Lawn recommend the proper lawn treatment and landscape changes that may help protect you, your family and pets from Lyme and other tick-borne diseases. In the instances where an Organic Tick Control Program is necessary, we can provide a program to help protect you, your family and pets from ticks and the diseases that they carry. Our Organic Tick Control Program uses cedar oil, a natural essential oil that acts as a pheromone interruption agent that impairs the mental capacity of the tick. The peppermint bio-solvent eats through the insect’s exo-skeleton and eradicates it – eliminating the egg and larvae. The fatty soap acts as a sticker to the insect. For every insect your see, there are many more in egg and larvae stage. The cedar oil and ethyl lactate destroys the egg and larvae stage, breaking the egg layer cycle and eliminating the next generation of insect. This is a non-toxic product. Yards can be used within 15 minutes of spraying to allow drying time. Early Spring - Apply 100% organic, natural tick control formulated to dissolve the insect egg and larvae eliminating the next generation of arthropod while the cedar aroma creates a barrier of entry making the treated area off limits to ticks and other pests. Late Spring - Apply 100% organic, natural tick control formulated to dissolve the insect egg and larvae eliminating the next generation of arthropod while the cedar aroma creates a barrier of entry making the treated area off limits to ticks and other pests. Summer - Apply 100% organic, natural tick control formulated to dissolve the insect egg and larvae eliminating the next generation of arthropod while the cedar aroma creates a barrier of entry making the treated area off limits to ticks and other pests. Late Summer	- Apply 100% organic, natural tick control formulated to dissolve the insect egg and larvae eliminating the next generation of arthropod while the cedar aroma creates a barrier of entry making the treated area off limits to ticks and other pests. Fall	- Apply 100% organic, natural tick control formulated to dissolve the insect egg and larvae eliminating the next generation of arthropod while the cedar aroma creates a barrier of entry making the treated area off limits to ticks and other pests. Tuff Lawn guarantees satisfaction. If any application does not achieve satisfactory results, we will reapply that application at no additional cost to you.